Roughly one-third of people never floss, while nearly 40 percent only floss sometimes. Be determined to make 2019 the year when you stop being a statistic and start being a regular flosser. Flossing is vital because cleans the tight spaces between your teeth that a toothbrush cannot reach. It can also mitigate staining and contribute to fresher breath. You might find it easier to become a regular flosser if you place your floss somewhere out in the open so it serves as a visible reminder of what you need to do. You can also ask your significant other to motivate you to floss daily; perhaps it’s a goal you can work on together. Make plain water, rather than soda or flavored coffee, your beverage of choice. Read nutrition labels — some foods may have a lot more sugar than you think. Look for low-sugar or sugar-free ways to satisfy your sweet tooth. For example, if you need a fizzy treat, choose diet soda rather than regular. 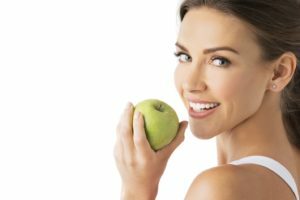 Crunchy fruits and veggies, like apples and celery, are great for removing plaque and food particles that might be clinging to your teeth and gums. Foods that are rich in calcium, like milk, cheese, and broccoli, can strengthen teeth. Leafy greens, green tea, and other foods that are rich in antioxidants can fight inflammation and thereby help to combat gum disease. To achieve the best oral health possible, you need a dentist’s help. Routine cleanings remove tartar from your teeth and help to identify weaknesses in your daily oral hygiene habits. Checkups identify oral health issues before they become severe and painful. If you’ve been neglecting regular dental appointments in recent years, 2019 is the perfect time to get reacquainted with your dentist in Beaumont! Dr. Michael Olson is a Texas native who has been practicing dentistry for over 15 years. He is a member of the American Dental Association, the Texas Dental Association, and numerous other professional organizations. If you would like Dr. Olson’s help to take the best possible care of your smile in 2019, contact our office at 409-860-9600 to ask questions or to schedule your next checkup.